ISRAEL said on Friday its aircraft hit around 100 Hamas targets in the Gaza Strip overnight in response to rocket fire from the Palestinian enclave, including toward its economic capital Tel Aviv. “Fighter planes, attack helicopters and (other) IDF aircraft attacked overnight about 100 terror targets of the Hamas terror organisation in the Gaza Strip,” Israel’s military said in a statement. It said targets included an office complex allegedly used by Hamas to coordinate militant operations in occupied West Bank. Another was a “the main manufacturing site of standard-grade rockets in the Gaza Strip,” an underground location, it said. 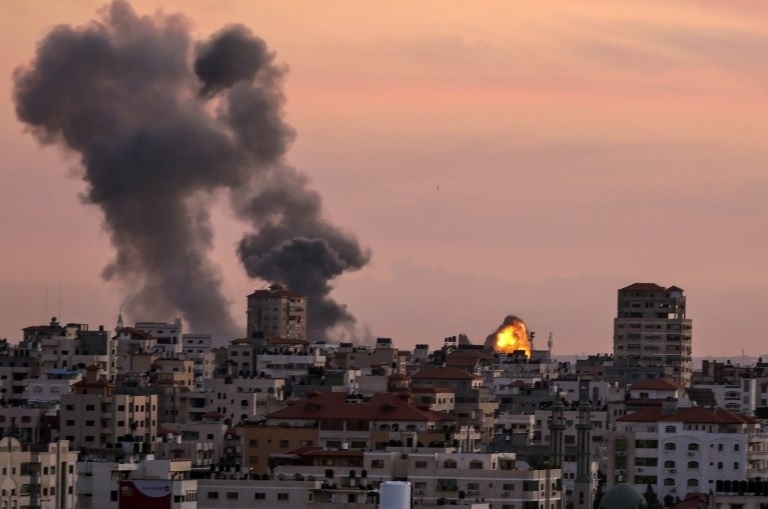 A security source in Gaza said dozens of strikes targeted bases belonging to both Hamas and its ally Islamic Jihad throughout Gaza. More than 40 locations were targeted with about 100 strikes, the source said. A couple was injured when their house was damaged in Rafah in the southern Gaza Strip, according to the source. Residents reported a number of rockets being fired back at Israel in response. Sirens rang out in southern Israel early on Friday and the Israeli military said its missile defence system intercepted two rockets. No Israelis had been reported wounded. Gaza border protests called off after Israel air raids: WEEKLY protests along the Gaza-Israel border were called off on Friday after a military escalation between the Jewish State and Palestinian militants in the territory, organisers announced. “In keeping with the public interest, the commission has decided to exceptionally postpone its activities scheduled for this day,” the body which organises the protests said in a statement. Protests will resume in the coming weeks, with particular preparation for the one-year anniversary of their beginning on March 30, it said.